Putting these pokemon on your team will probably take up a lot of slots, so try to double up on your HM moves if possible. You won't need 'em for long, and you can swap between 'em as you travel to get each of the Regis. - Travel to Route 133 (Flying or soaring is best) and Surf into the currents. Head west until you come to an island that consists of shallows. Sail west from here by using the gap of four spaces in the island's west side. You'll travel to a spot where you can Dive, and when you do, you'll find another Dive spot below that leads to the Sealed Chamber. - This place is teeming with braille message that you can decode. Head north through here and you'll find a large wall with more braille. Use Dig directly in front of the wall (you basically have to be nose-to-nose with the wall for it to work) and a door will appear. - The next room is more or less the same, though the braille message in the north is much longer. It will tell you to put Relicanth and Wailord in your party. Put the Relicanth in the first slot in your party, then put the Wailord in the last slot. Read the braille after doing this and you'll unlock doors 'far away'. You're now done with the Sealed Chamber. Now that you've unlocked the secrets of the Sealed Chamber you can set about capturing three of the four Regis. They live inside stone monuments spread throughout Hoenn, ones that you've probably seen before. 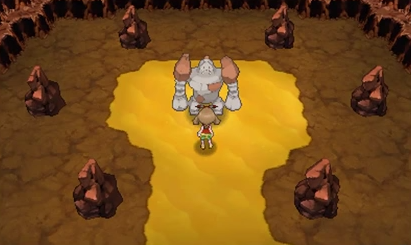 May prepares to take on Regice within its Island Cave lair. The first legendary you can face, Regice is located in the Island Cave on Route 105. You'll find it most easily by heading northwest from Dewford Town. As you'll learn with the other two legendaries, you need to do something (braille!) to get to Regice. In this case, read the braille on the northern wall, then sit in place for two minutes. Do this and the path to Regice will pop open. As its name hints, Regice is a pure ice-type. Make sure you give Regice a nickname after you catch it. You'll see why below. 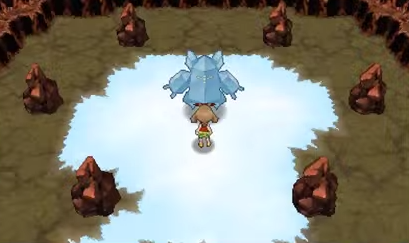 May approaches Regirock in the Desert Ruins. The second of the Regis lives in the Desert Ruins, a monument in the far south of the Route 111 desert. Once inside, wander north to read the braille wall, then walk right twice and down twice, in that order. Use Strength on this spot to make the path to Regirock open. Regirock is a pure rock-type. 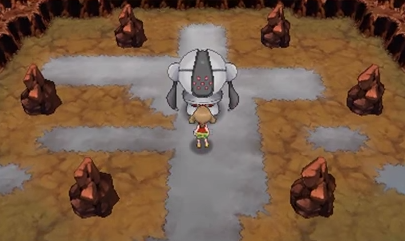 May confronts Registeel within the Ancient Tomb, ready to fight. 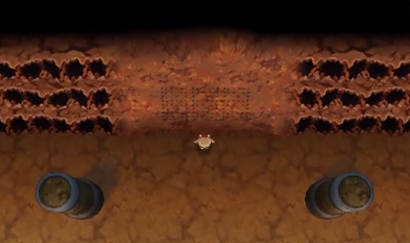 The third Regi lives in the Ancient Tomb of Route 120. You'll find the Tomb west of the exit to Route 121, up some stairs and in the rear of the Route. This time you need to stand in the middle of the Tomb (I think the streak of metal on the floor will do) and use Fly. This will unlock the northern room and reveal Registeel. Surprise surprise, Registeel is a pure steel-type. 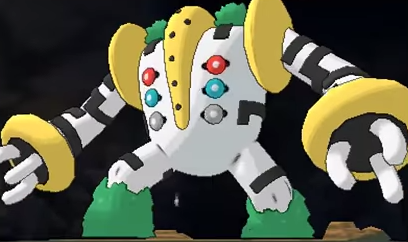 The mighty Regigigas, ready for battle. Once you've captured all three legendaries, put them in your active party and return to the Island Cave on Route 105 during the day, one day after collecting them all. Have Regice hold one of the icy items you found earlier and walk into the rear section of the cave, where you fought it in the first place. If you've done this correctly, Regigigas will appear with a rumble and take you on. Regigigas is a normal-type legendary, and will grow (effectively double) in Attack and Speed if it's on the field for more than five turns. Use caution. Tips for choosing Pokemon for HM's. Personally I always have starter + region's bird pokemon every game (pidgey/pidove/starly/taillow/etc). Flying types are very useful and reliable, with few type weaknesses. You're pretty much covered for HM 02 Fly. For Dig, I've enjoyed having Krookodile (or previous evolutions), at this point you should already have the TM for Dig, so teach it that, or teach it to anyone else in your party. I have been using Linoone for strength/cut/rock smash/surf. Later on I switched from Linoone to Azumarill, another easy pokemon to raise/catch. Azumarill can learn: Strength/Rock Smash/Surf/ Dive. Thanks for that, dude. I used Azumarill for this quest as well. Mind if I quote this up top for other readers? Why do I have to nickname Regice? Battle with Regigigas happened immediately. I didn't have to wait another day. No clue, anon #1. No clue at all. Dunno what to tell you, then. It refused to happen for me right away. I didn't change my 2DS's internal clock to make it happen, either, which is what usually screws up legendary events. Did you catch all of your Regis in one go? Seriously though, why nickname Regice? Does it actually matter? I accidentally beaten regigigas and saved.